Altitude Training Gyms Why use Altitude Training? When you are doing everything else right and may have reached a performance plateau, Altitude Training will bring about a significant improvement to move you to the next level. Altitude training is an incredible way to try and maximise your body’s capacity and efficiency. Either as a plateau buster, a training block to start a season firing on all cylinders or as an ongoing strategy to train smart and get the biggest bang for your buck, altitude training can fit into your plan and make a significant difference to your fitness and performance. 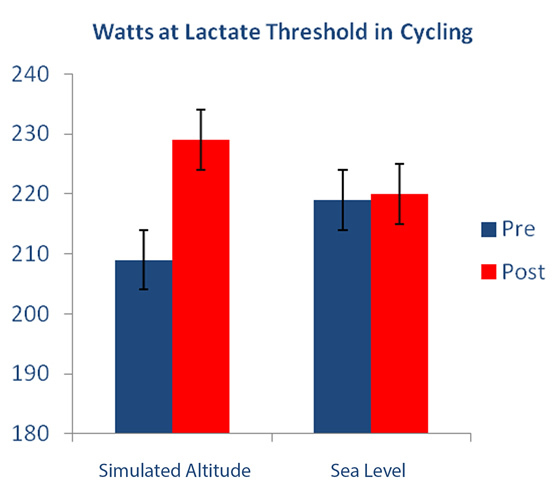 The example on the left is illustrative of the improvements readily achievable by Altitude Training. Illustration taken from a paper by Puype et al, 2013, Med Sci Sport Ex.